Talking Dogs at For Love of a Dog: Sunshine Monday! 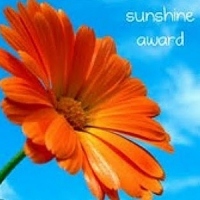 We're thrilled to share this news: Dogs N Pawz has generously passed the Sunshine Award on to Talking Dogs blog. We certainly appreciate this award! Facebook or Twitter: Not keen on either one, but I do both. Again, thanks so much to Dogs N Pawz! The gang at Saved by dogs. Thanks so much for including me in your celebrations. And congrats to you for your award! Thanks! How could Fred and Gloria (and you) not bring sunshine!! Congratulations, and thank you so much - you're too sweet! Thank you! And congratulations on being a official Be The Change team member! WOOF! congratulations on your award~!! I like your "pattern" as being Karma! Congrats on your well-deserved Sunshine Award and thank you so very much for honoring Daley's Dog Years. That certainly makes my day! I love your answers to the "favorite pattern"
Ooh, a blog award! Thanks so much!